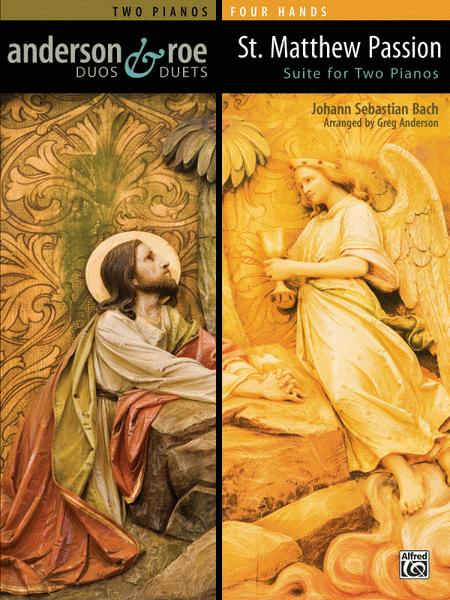 Johann Sebastian Bach's St. Matthew Passion, considered one of the monuments of music literature, is filled with multidimensional levels of symbolism, theological understanding, and psychological insight. In this awe-inspiring arrangement for two pianos, four hands, five movements from the original work have been carefully selected. Together they retain the dramatic arch of the story, but pare the music down to a more manageable duration suitable for performance on recitals. Two copies required. "Aria: Aus Liebe will mein Heiland sterben," "Aria: Erbarme dich," "Aria: Mache dich, mein Herze, rein," and "Chorale: O Haupt voll Blut und Wunden" are Federation Festivals 2016-2020 selections.